I sometimes serve individual cheese platters for the cheese course after the plat principal. I find it is easier to serve cheese this way, than having a heavy cheese board or platter going around at the table with each person having to find a place to rest the platter and cut his cheese. Along with the individual portions, I keep the platter close by, for those who want an extra helping and so the cheeses and their names can be seen. Serve small helpings of diced fruit in season along with your cheese. It is optional. In France you will very rarely be served some fruit with your cheese, but I find that most people enjoy a hint of fruit on the cheese plate, eevn if only for its uplifting colour! DON”T forget a good red wine! I prefer to serve simply une baguette tradition with the cheese, simply becasue the slices are small and crusty and aren’t overwhelmingly heavy and is just perfect with any cheese. Honey is also a good accompaniment to some cheeses as well as a quince paté. 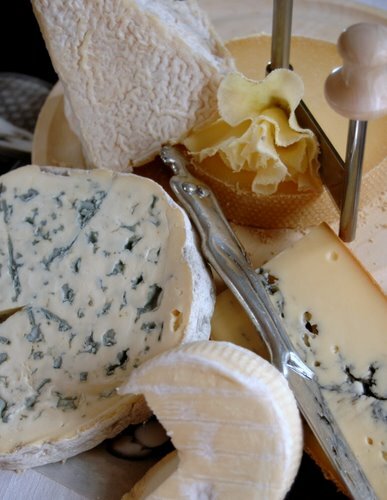 Serve a variety of cheese – start from a hard cheese, a soft and creamy one, a blue cheese and a goat’s cheese as basis and add to that maybe an unknown cheese or exotic or an artisan cheese, or your favourite. Round cheeses are normally sliced from the middle outwards. Triagular cheeses are easiest to lay flat and sliced from the thin end upward to the thickest. A pyramid is sliced from the top to the bottom. Serve a tete de moine (the frilly cheese in the photo below) on the shaving board(if you have one), as it always pleases the guests to shave some for themselves. You can serve thse individual cheese platters as a starter, or as a small aperitif before the meal, but then skip the cheese course after the main dish. * I can’t walk past anything that has a story. 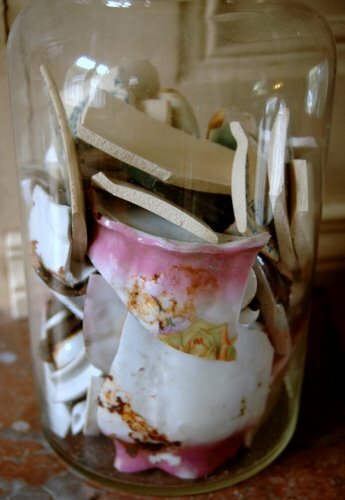 I own broken cups, and burnt linen and chewed up books and mildewed paintings – all because they have stories behind them. My wooden floorboards still have patches of old paint drippings. I left part of a wall unpainted, because we discovered abeautiful old frieze. I refuse to replace the old glass of some of our windows with double glaze, because it is still the original glass and you can see the tiny bubbles and other defects. And so I have this beautiful antique linen tablecloth with its complete set of napkins, whih I only bought because it made me cry. It belonged to an old lady, who grew up in a typical bourgouise family. She received beautiful lines for her trousseau as a young girl, one of which was this set of table linen. She used it for her fromal dinners and one evening when entertaining guests, one napkin was dropped on the floor, the family dog got hold of it and chewed it to get to the meat juices on the napkin. So the elegant old Madame gently washed the napkin by hand, repaired it with needle and thread by hand, ironed it and placed it back with the set. When she got old alone, she went to an old age home, but had no children to pass her linens on to. So she gave it up to be sold. I was heartbroken when hearing this sad tale and couldn’t leave the brocante without it. 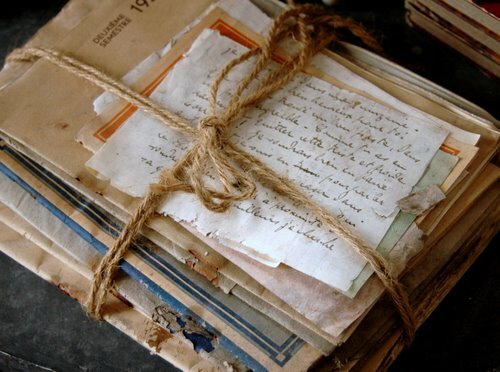 I trust it is the truth, because I know Madame aux Brocantes, who specializes in old linens, very well. She always keeps some things aside for me, especially when they have a story behind them. 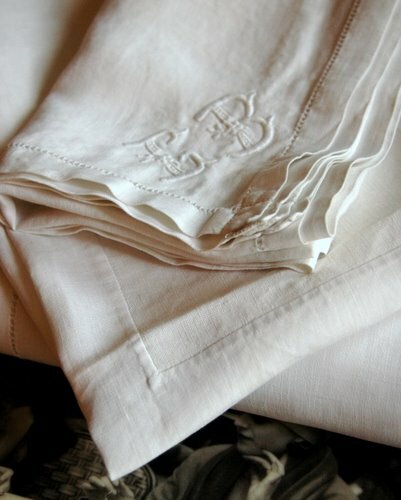 Each time I set my table with this beautiful linen set, I fold the chewed up serviette for myself. I think of old Madame and hope she looks onto me from wherever she is, with happiness. 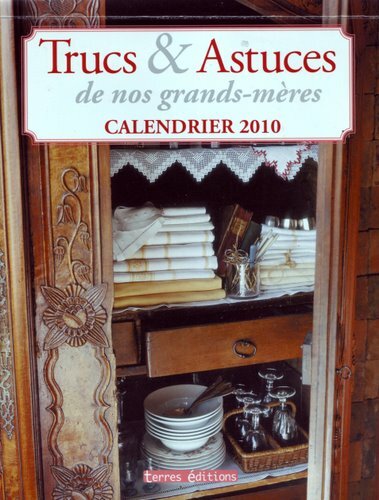 * Always interested in how people lived in all ages, I recently got this cute calendrier for 2010, not for the calender but for the content, which holds tips and tales from days gone by. Some are real good advice and some make you giggle…for you to decide which! *For whiter teeth – dip your finger in olive oil, rub it against your teeth and keep it for several minutes in your mouth before rinsing, OR, rub a sage leaf against your teeth once a week. Previous Article Stuffed cornes de boeuf peppers and a book on food and painting. Now I’m really hungry and it’s 3:39 am here. Love the story of the elderly lady. I’m glad you are the one who got the table setting as you appreciate it more than most would. I do believe the story of Madame..because I have my mom’s linens..that were my grandmother’s linens.. and I wash and starch and care for them:) If something tears..I sew it.. 🙂 Just because..I am like Madame for sentimental things..
And you are too..I can see..I would have the chewed up serviette for myself too..I realize it’s not so unusual and many must be this way..but it’s charming you write of it and some see ourselves.. I live in a newer home..and would love an old one.Full of history..you are so fortunate..perfect for the artist. I think you’re the perfect person for the linen tablecloth set. it would make me feel that our lady was with us. It is a cheese night for me but it’s to far to walk across That Pond– too bad, becuse I am in the mood. If ever you die and have nobody to leave it to, I would be glad to have your cheese shaver……ha-ha!!!!! Lovely story and yes I am sure madam is happy where ever she is!!! What a georgous cheese platter!! 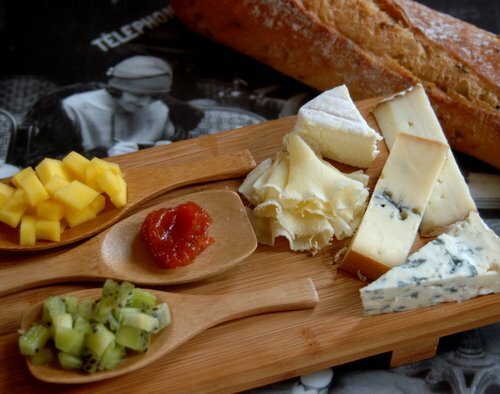 I would like to sit there besides you & enjoy these wonderful cheeses, lovely enjoyed with some good glasses of & fine French wine,…Just lovely!! Ronell, I found myself with a lump in my throat when reading this post. I love the stories of a world we’ve left behind, and which has so much to offer us. Thank you, thank you, for sharing the story of your linens with us. I send you an e-hug. I love the idea of individual cheese platters. What a nice way to serve the cheese course! a beautiful story and i would have bought the linen also. what a treasure you have and cheese plates are my favourite dinner or ti eat with a nice wine thing. Fabulous cheese platter. Great idea to serve individual, I will try that! Congrats on Top 9 today! Well-deserved. what a fantastic idea. and i _love_ the story of the old lady, i would definitely have made that purchase too! What a beautiful but sad story! Love the idea of individual cheese boards (although I’m afraid I love oatcakes too much to leave them off my cheese board!). Mmmm, Morbier 🙂 Fell in love with it in Morzine when we were skiing last year. And as for the cheese that you shave – I think I’m in love!